Carpet your stairs in 5 minutes with no adhesives! Custom sizes, shapes, & quantities available! Carpet stair treads, area rugs, and runners! Custom sizes, shapes, and quantities available! 1-800-616-8808 (USA) or 706-529-8808 (International). Always FAST & FREE continental U.S. shipping! Make your stairs safe and buy American! 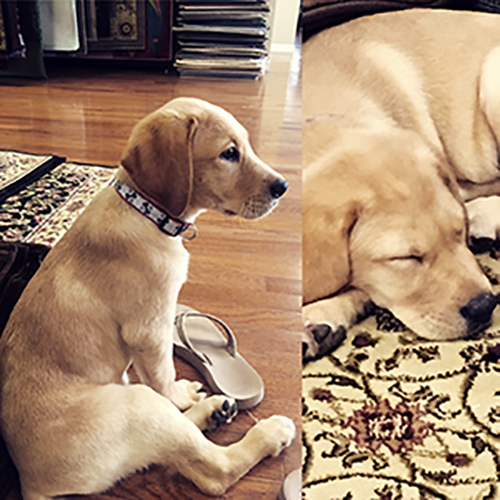 Add a touch of warmth and style to your home or office with unique, beautiful, pet friendly, dog approved, top quality, American made, and affordable carpet stair treads from Dean Flooring Company! Order custom stair treads and runner rugs for your home by calling 1-800-616-8808 today. Add a touch of warmth and style to your home or office with unique, beautiful and affordable carpet stair treads from Dean Flooring Company. Dean Flooring Company manufactures a unique line of high quality, stylish and incredibly functional stair treads and rugs that will add panache to your home or office - and you won't find quality like this elsewhere. Whether you're looking for treads that help your pets up and down hardwood stairs or you'd like something that exudes class and style to provide traction for you and other family members, you'll find exactly what you need in our extensive selection. Your home is one-of-a-kind, so you can't settle for a one-size-fits-all stair tread set. That's why we offer solutions that are just right for you. If you don't find a perfect fit in our catalog, let us know. Our customers are always our top priority, and we'll do what we can to improve the safety in your home while adding a splash of style. One of the most common causes of injuries in the home is a slip-and-fall. Millions of people are hurt because of this every year, right in their own homes. Doesn't it make sense to do everything within your power to make your home as safe as possible? We can help mitigate the risks and eliminate the ever-present hazard of a tumble down slippery stairs. Dean Flooring Company is the leading manufacturer of carpet stair treads that can make slippery wood stairs safer and more beautiful. Here at Dean Flooring Company, our carpeting stair treads are different from all the rest. We offer some tape- and adhesive-free stair treads that are perfect for home- and business-owners who don't want to risk damaging their stairs. Unlike the competitors, our adhesive-free stair treads are actually slip-resistant. What's more, with stair treads, carpet only covers a portion of your stairs. For this reason, many people select this option as opposed to full stair carpeting so that the beauty of the stairway isn't covered or compromised. Our affordable carpet stair treads come in a huge variety of colors and sizes. They're easy to install and clean, and they provide superior traction for everyone in your home - even the family dog. You won't have to worry about elderly family members or young children; they'll be able to navigate stairs easily. Carpet stair treads also reduce noise and help protect expensive hardwood floors from everyday wear and tear. Whether you need a unique size or shape for curved stairs or you want a specific pattern or material, we can create them for you. Stop worrying about dangerous slips and falls and add beauty, security and comfort beneath your feet. We have an extensive selection of styles, sizes and patterns in our stair tread collection, but sometimes our customers require something a bit different. If you don't see what you need, it's no problem. We manufacture our products in-house, and we'll make your stair treads according to your exact specifications. You can choose length, style and colors to create your own set of stair treads. The bottom line is that we'll work to meet your expectations, and we won't be satisfied until you are. You can learn more by reading our frequently asked questions or discover what Dean Flooring Company is all about. It's simple, we offer the best quality products, the best service, the most options, custom solutions, fast and free shipping, and our products are made in America. At Dean Flooring Company, we are small enough to know you, but large enough to serve you. Buy from the innovators, not the imitators. We are the original stair tread company and we are the only company to offer stair treads that do not require any adhesive, tape, glue, staples, or peel and stick backing for installation. If you want a product that truly stays in place without any damaging adhesives, please select one of our products labeled as "tape free pet friendly" stair treads. Dean Flooring Company offers that largest selection of colors, sizes, materials, patterns, styles, and shapes of any other carpet stair tread seller or manufacturer anywhere. In addition, our stair treads are custom hand made to order by artisan rug makers with many years of experience and they are made in the USA in our factory in Georgia. We can customize your order to your specifications if you need specific quantities, shapes, or sizes while remaining fast and affordable. One of our friendly sales representatives will be glad to walk you through the quick and easy order process when you give us a call. Finally, our products are the finest quality solution available on the market and are far superior to the cheap out of the box options which are imported from other countries. 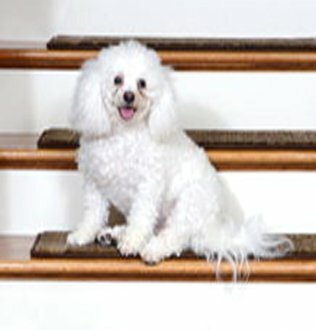 So when you need to protect your family and dog from dangerous slips, want to beautify and add comfort to your home and need to protect your expensive hardwood floors, buy your carpet stair treads and runners from Dean Flooring Company and, as always, receive fast and free shipping and superior quality and customer service! Besides grade-A stair treads, Dean Flooring Company also offers an expansive collection of quality-made area rugs, mats and runner rugs. Update your living space with down-to-earth sisal rugs made with rugged, natural materials or complement your screened-in porch or patio with heavy-duty outdoor area rugs that bring warmth and practicality. You'll also find carpet and mats for your boat, outdoor entrance mats, and specially designed cabin rugs, runners, and mats for your outdoors, mountain, western, southwestern, cabin, and wildlife themed areas. Dean Flooring Company specializes in custom rug sizing, so if you've got a large or difficult configuration, we'll be happy to custom-make a rug that is tailor-made to your space. When you shop with us, we give you our 100 percent satisfaction guarantee. For your convenience, we accept a variety of payment options including Visa, MasterCard, Discover and American Express. Call us at 800-616-8808 or 706-529-8808, Monday through Friday from 9 a.m. to 5 p.m. EST.